Richard Mosse's latest work in colour infrared, The Enclave, is opening at the Venice Biennale this week and running until November 24th. I've previously noted his work in the Congo with medium format infrared Aerochrome/Ektachrome. This time it's a multiscreen movie, shot on 16mm and shown in an HD transfer. A 240 page book is being published by Aperture to coincide with the event. I'm curious as to where he got the 16mm film stock but perhaps it's the Super-16 made for the Wristcutters project but never used. The venue is the Irish Pavillion, Fondaco Marcello, San Marco 3415 (Calle dei Garzoni), 30124 Venezia which is near the Traghetto San Tomà. Sadly my May culture has been provided by the rebooted Rijksmuseum in Amsterdam and I won't be in Venice. Richard is representing Ireland at the Biennale and there is more on the Ireland at Venice web site. It's very sad that Simon Marsden's refrigerated and dwindling stock of Kodak HIE outlasted him. He was, to my mind, the finest and most consistent user of that idiosyncratic film stock with its haloed highlights and exaggerated grain. That's not to understate his abilities in the darkroom, but it's the classic HIE look that I will remember him by. The goal of my work has essentially always been the same: to demonstrate that magic is real or that reality is magic. I have used infrared film for its ethereal quality, day is turned into night and nothing in this twilight world is quite as it seems. The unusual texture of the film's grain produces a timeless feature that lies somewhere between an etching and a photograph. The trail that began with ruined Irish castles has finished with an eerie collection of Russian landscapes in the book Russia: A World Apart. 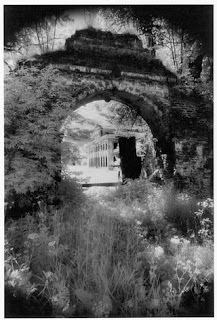 Some are unkempt ruins, which always lend themselves to the increased contrast that infrared brings. I sometimes think that our ruins here in England are too neat: should a derelict monastery be set in manicured grounds? Not all the places visited are ruined: the Winter Palace in St Petersberg is not, but stands under a brooding cloudy sky while the sun fails to break out from behind the Alexander Column. Backlighting is another hallmark of much of Simon's work. I should not forget the text. Duncan McLaren, who collaborated on those Irish Ruins (indeed he instigated that first project) and a post-USSR venture beyond 'the wall', accompanies the photographs and photographer again. He tells the stories of not only the artefacts' past but often what is happening now; the people he and Simon met on their journey. 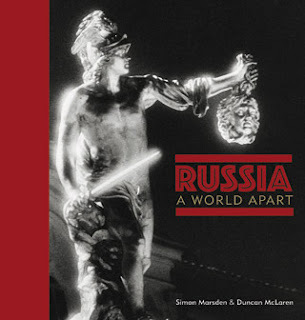 Russia: A World Apart is an atmospheric book; in keeping with the best of Simon Marsden's work. Infrared photography is a genre that you either love or just don't get. This book demonstrates one aspect of it at its best. The ITV channel in the UK are repeating the Perspectives documentary where David Suchet "follows in the footsteps of" his grandfather, photographer James Jarché, known as Jimmy. It's on Sunday May 12th at 2215. Although this documentary doesn't touch on it (but don't let that stop you watching), Jarché was one of the pioneering photographers who, in the 1930s, experimented with the new infrared film and had several of these photos published in the Daily Herald. One of them, showing children watching a cartoon in the cinema in 1934, was included in the Infrared 100 exhibition. He was originally asked by Ilford to document the process of making film, which happens in the dark, and he used Ilford's infrared film for that. You can see the cinema photo in the National Media Museum/Science and Society collection and Wikipedia have an article about him.